We are SO excited to kick off the new year with our top picks of Canadian Herbal Blogs. 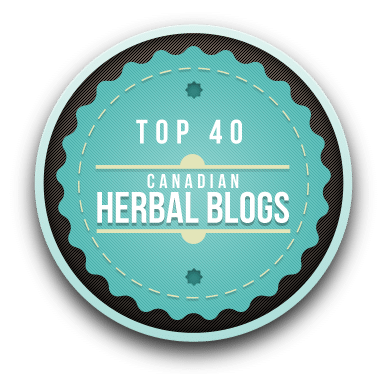 After months of research and exploration, we’ve finally narrowed our short list of the top herb blogs in Canada down to forty. It was a tough choice, but we’re certain you’ll agree that these outstanding sites merit a spot on our Top Forty List. These educational sites offer awesome content, are easy to navigate, and are nicely designed. All sites are listed in alphabetical order. So check it, enjoy, and share the love! Katolen Yardley is a Vancouver-based medical herbalist, herbal clinician, educator, and natural health product formulator. Her site offers a wealth of information on medicinal herbs, natural health, and herbal treatment strategies. Angela Warburton is a Doctor of Traditional Chinese Medicine with a primary focus on fertility. She practices in a multi-disciplinary clinic in Toronto, ON. Angela writes about using herbs and whole foods to support seasonal health. James Christian is a UK trained and licensed medical herbalist based out of Victoria, BC, who is very passionate about nature, the environment, and indigenous medicine. His site includes articles on lifestyle and healing, video tutorials, book reviews, herbal formula recipes, and herbal treatment strategies. Awakening Wellness Center is a multi-disciplinary wellness clinic located in Victoria, BC featuring experts in Western Herbal Medicine, Traditional Chinese Medicine, Ayurveda, Acupuncture, Massage, Biofeedback, and various holistic healing modalities. Their blog features articles on wellness and alternative medicine. Best Health is a natural health-oriented magazine featuring articles on all aspects of healthy living, including several articles on herbal medicine. The Body Mind Institute is a digital education initiative founded by Lars Gustafsson geared towards producing and delivering high impact educational courses, products and services from subject matter experts in wellness and alternative medicine. Articles are focused on herbs, spirit, health, relationships, parenting, and more. Canadian Gardening is a magazine focused on plants and gardening featuring inspiring articles, gardening tips, and plant advice for gardeners of all levels. Candice Ashley May is a registered herbalist, massage therapist, and owner of Rural Herbal Apothecary. Candice May runs her private practice on Cortes Island, BC, where she offers complete integrative medicine consultations and therapeutic massage. Her blog features lovely articles on herbal medicine and holistic health. Monika Ghent is a practicing herbal practitioner based out of Toronto, Ontario. She blends traditional western herbalism, contemporary scientific knowledge, and plant spirit wisdom to support natural healing. Monika writes lovely articles about medicinal herbs, natural healing, and herbal recipes. Karen Stephenson is an author, professional writer, and editor with a background in herbal pharmacy and wild edibles. Her educational site is geared towards the promotion of weeds as an alternative food source. Articles are focused on foraging, recipes, and edilble weeds and flowers in Central Canada. Elements of Health is an integrative acupuncture and massage therapy center based in Victoria, BC with a multi-disciplinary approach to health. Their site features articles on Traditional Chinese Medicine, natural health, whole foods, and herbal medicine. Colleen Emery is a practicing herbalist and natural health practitioner based out of the Kootney Mountains in BC. She offers workshops and private consultations, and runs a public apothecary. She writes a variety of articles on herbal medicine and offerings in the Kootneys. Evita Ochel is a consciousness expansion teacher who helps others live out the full potential of their being. She offers guidance and resources in the areas of spirituality, personal evolution, natural health, and holistic well-being. Her site features a wealth of articles on a large variety of topics including wellness and alternative medicine. Pat Crocker is a home economist, writer, educator, and culinary herbalist based in Southern Ontario. She is a best-selling and international award-winning author of 10 cookbooks and 3 herb booklets. Her blog features excellent articles on culinary herbalism. Danika Anderson is a native New Zealander, mother, dancer, and folk herbalist living in the Okanagan region of BC. Her site is a wonderful resource on crafting the local weeds of BC into food, home remedies, and skin care. Sean Donahue is a traditional herbalist, witch, and teacher living in Victoria, BC. His approach to herbalism is grounded in a deep connection to the living Earth with an emphasis on personal, cultural, and ecological healing. His blog features articles on magic, medicinal herbs, poetry, and healing. Yarrow and Angela Willard are practicing herbalists, health educators, and owners of the Harmonic Arts Botanical Dispensary based in the Comox Valley of Vancouver Island. Their site features articles on wellness and holistic health, medicinal plant offerings, recipes, and excellent video tutorials on herbal medicine. Evelyn Coggins is a registered herbalist with a Masters level education in herbal medicine. Evelyn owns and operates a private practice in Pemberton, BC, and writes articles on her site about phytotherapy, medicinal plants, and natural healing. Elizabeth Walker is a clinical herbal therapist who owns and operates an herbal apothecary in Edmonton, AB. Her blog features excellent articles on medicinal herbs, health conditions, and natural health. In Love With Plants is the personal blog of Barbara DuTot – a wise woman herbalist, educator, and director of Wild Roots Learning Center based in Enderby, BC. Barbara shares her love of plants and landscapes through articles on medicinal herbs, weeds, wild plants, and herbal medicine making. The Light Cellar is a Calgary-based family-owned business founded by Malcolm Saunders and Laura Milinusic offering fairly traded and organic superfoods, superherbs, medicinal mushrooms, ferments, elixirs, and raw chocolate. Their blog features articles on wild foods, herbs, and superfoods. Cat Lane is a practicing herbalist, educator, and animal nutritionist based out of the Gatineau Hills in Wakefield, Québec, where she runs a private practice for humans and animals. Her site features articles about herbal medicine, animal nutrition, and herbal happenings in the Outaouais region. Michael Vertolli is a traditional Western herbalist who has been practicing for over 25 years. He is an activist, educator, researcher, and writer based out of Southern Ontario. His site features a variety of excellent and thorough articles on medicinal herbs, herbal treatment strategies, ecological health, and herbal medicine making. Nancy Desjardins is a natural holistic nutritionist based out of Georgetown, Ontario. She offers private health coaching and teleclasses through her online health academy. Her blog features interviews with health industry experts, as well as articles on herbs, foods, and lifestyle practices for healthy living. Nick Furfaro and Laura Shaw are wilderness survival educators based out of Douglas, BC. Their workshops and classes on wilderness survival include using plants for everything from tools and shelter to food and medicine. Their site shares information on ecological knowledge and wilderness survival. Vicky Chan is a Chinese herbal nutritionist who teaches therapeutic cooking based on the principles of Traditional Chinese Medicine. Her site features detailed information on the nature, characteristics, and therapeutic effects of common Chinese herbs, as well as cooking tutorials, recipes, and whole foods articles. Sarah Anne Lawless is an occult artist, author, animist, and naturalist based outside of Vancouver, BC. She offers rituals and workshops throughout BC on bioregional animism and herbalism, as well as magical and poisonous herbs. Her site features gorgeous articles on magical herbalism, and the occult. Seraphina Capranos is a homeopath, herbalist, and educator based out of Salt Spring Island, BC. She operates a private practice and teaches a variety of courses and workshops throughout the Pacific Northwest. Her site features articles on holistic health, natural healing, and herbal medicine. Amanda Dainow is a clinical herbalist based out of Halifax, NS. She runs a private practice for both humans and animals, and teaches workshops and classes on herbal medicine, Reiki, and natural animal care. Her site offers articles on medicinal herbs, natural healing, and domestic animal health. Correne Omland is a traditional herbalist and clinician based out of Oshawa, Ontario. Her blog offers information based on the practices of traditional Western herbalism, and features articles on local herbs, herbal preparation methods, and the systems of the body and their herbal treatments. Carol Little is a traditional herbalist based out of Toronto, ON, where she has a private practice working with busy women on the go. Her site features articles on medicinal plants, herbal medicine making, and natural health. Tealish is a modern tea boutique in downtown Toronto, ON. Their blog features creative ways to use and prepare herbal and conventional tea infusions, as well as unique recipes and tutorials for using herbs in food and beverages. Dr. Terry Willard, PhD, is an iconic clinical herbalist with over 35 years of experience as an herbal practitioner, teacher, and herb school director, as well as the author of twelve books. His blog features articles on medicinal herbs, health conditions, alternative healing modalities, and metaphysical topics. Todd Cladecott is a clinical herbalist, author, and educator based out of Vancouver, BC with a background in Ayurveda and traditional medicine. His website features a wealth of quality articles on natural health topics such as traditional healing modalities, herbal medicine, food as medicine, and more. Articles are accessible upon free registration. Nikki Manzie is a yoga teacher, Ayurvedic practitioner, educator, and co-founder of Three Winds Academy. Her blog features articles on natural health, plant spirit medicine, and healthy living. Garliq is an herbal educator, clinical herbalist, and founder of the Urban Herb School based out of Vancouver, BC. His blog features articles on medicinal herbs, healing, natural remedies, and herbal recipes. Vitality medicine is one of Canada’s largest publications on natural health, alternative medicine, and green living. Their site features articles on medicinal herbs, natural remedies, health conditions, and healthy living. Gayla Trail is a gardener, writer, and photographer with a background in fine arts, cultural criticism, and ecology. She is the author, photographer, and designer of several best-selling books on gardening, cooking, and preserving. Her site is an account of her personal experiences with nature, plants, and gardens. Young and Raw is a place for people to learn about the healing and cleansing benefits of raw foods and whole foods. The program is the creation of Caleb and Sheleana Jennings, and includes a team of nutritionists, naturopaths, and herbalists. Their site features articles on health and nutrition, personal growth, recipes, and product reviews. This is a great resource to have and I thank-you very much for having my blog on this list! I am really touched. Thank-you Karen, and my pleasure! I really enjoyed discovering your site. Thanks Melanie!!! Appreciate you taking the time to put this togther for all of us. It’s great information and a part of my dream of bringing herb peeps into contact with each other to create community! Thanks for including my work and Studio Botanica! My pleasure Carol! I’m glad to part of your community as well! Nice to see you back on Melanie, I’ve missing all your interesting posts. There’s plenty to feast on here! Enjoyed the list ! Please keep my blog in mind for next years list. Thank-you so much for sharing Brian! It’s lovely to discover your site, and I hope to make it up to your herb farm some time soon! Perfect post, thanks for sharing and keep it up. Great Resource. Thanks for helping to keep the coals hot.